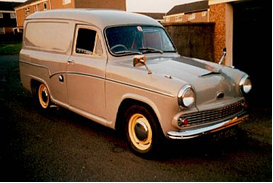 The new ½ ton van and pick-up was based on the Cambridge body styling and replaced the earlier A40 Somerset style. The A50 engine was used until 1963 when it was replaced by the 1622cc B-Series engine. The Austin badged vehicles were discontinued in 1971. After that they were sold as a Morris. Engine and Transmission: 1489cc; 47bhp at 4,100rpm; four-speed manual gearbox. bore x stroke 76.2x88.9mm; 56bhp at 4,500rpm.